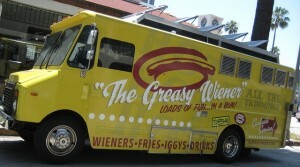 The Greasy Wiener – Los Angeles, CA – Come on, get your fun in a bun! (@thegreasywiener) – Food Truck Talk – Searching for the best foodtrucks! 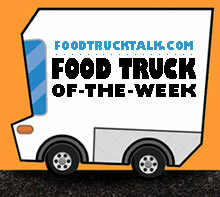 Congratulations to The Greasy Wiener as FoodTruckTalk.com’s Food Truck Of-The-Week! Is there any better way to celebrate Valentine’s Day than with a GreasyWiener? The Greasy Wiener serves up New Jersey style hot dogs with West Coast flavors from a multimedia food truck that will entertain you with music, videos and short films. You and your friends may also find yourselves to be part of the broadcast! Adam “Iggy” Dragotta and Eric Maczko hail from New Jersey and have created a really fun menu and food truck experience. Their New Jersey style deep fried hot dogs have the tell tale “snap” when you bite into them and have a great flavor. Before we go any further I will let you know that I remember my elementary school education. When spelling the “i” comes before the “e”, at least in most cases! So when typing Greasy Wiener I’m pretty sure I am spelling it correctly. However, the lead menu item at The Greasy Wiener, is the “Greasy Weiner”, or at least that is how it is spelled on their menu. Regardless, it tastes good! It’s a deep fried hot dog topped with mustard, grilled onions, a pickle spear (much easier and neater to eat then relish) with a premium topping choice or bacon wrap, kraut, cheese sauce or chili. 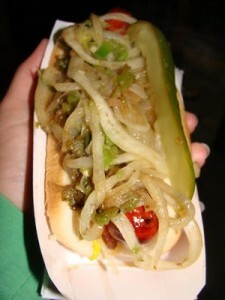 “The Bomb” is a bacon wrapped dog, mustard, chili/cheese, grilled onions with the requisite pickle spear. This is clearly a crowd favorite. Plus it’s fun to say, “give me the bomb”. Maybe not so smart at the airport, but at the Greasy Wiener it is acceptable. Also available are vegetarian and chicken apple sausages to meet your cravings. Other truck favorites include a variety of “iggy’s” or “iggs” which are angus beef sliders served on Kings Hawaiian Rolls. The Bacon Bleu Igg’s are two Angus beef sliders topped with grilled onions, bleu cheese, bacon and the Greasy Wienter “special sauce.” Need I say more?? Don’t miss The Greasy Wiener food truck’s curly fries. Available “plain” or with chili, cheese sauce, garlic, Italian parsley, wing sauce, bacon, and/or cheese crumbles. 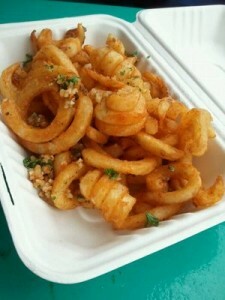 The Buffalo Bleus Curly Fries feature wing sauce along with a bleu cheese crumble, tasty indeed! All in all, The Greasy Wiener has a lot of great menu choices served up from a multimedia enabled truck. It’s almost like taking your lover to a fine dining restaurant that features strolling musicians. Ok, not really, but the Greasy Wiener will be just as enjoyable.